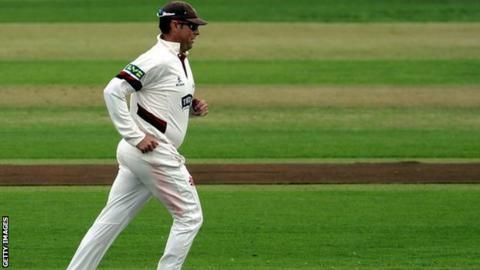 Somerset batsman Marcus Trescothick is still years away from retirement, says director of cricket Matt Maynard. The 40-year-old stepped down as the county's captain on Thursday. The opener, who made his Somerset debut in 1993, has scored 23,531 first-class runs and played 76 Tests for England between 2000 and 2006. "As long as Marcus retains that enthusiasm, he can still be around for a few more years yet," Maynard told BBC Somerset. "Brian Rose [former England batsman] took on a fearsome West Indies side at the age of 45 and Brad Hodge [41-year-old ex-Australia batsman] is still playing Big Bash cricket." Maynard insists Trescothick, who scored 1,284 County Championship runs at an average of 45.85 in 2015, remains one of England's best batsmen and will continue to be a prized asset for Somerset. "He is still one of the best batsman in the country," added Maynard. "I want him to carry on playing. He is a great ambassador for the club and he is an inspiration the all of the young players coming through."